An important addition to the site is the new Tyler Graphics Ltd (TGL) team page, dedicated to the immensely talented group of printers and workshop staff that made the astonishing print projects produced at TGL possible. This page reveals the truly collaborative nature of the Tyler workshops and the unique working environment that existed there. To bring you this information we contacted several former staff members and asked them to share with us their memories of the TGL workshops – with some fascinating insights and often amusing recollections. Yasu Shibata speaks of the excitement surrounding the production of Frank Stella’s The Fountain; the breadth of John Hutcheson’s printmaking knowledge and experience is truly staggering; and Barbara Delano recalls Saturdays with Robert Motherwell. Mark Mahaffey’s recollection of David Hockney’s 1984 visit to the workshop involves a pet rabbit; Kim Halliday reminisces about the camaraderie of the shop; and Duane Mitch remembers burgers and beers after the Chicago Art Fair. More of this valuable background information around the workings of a major print workshop will be added as we continue to make contact with TGL staff members. 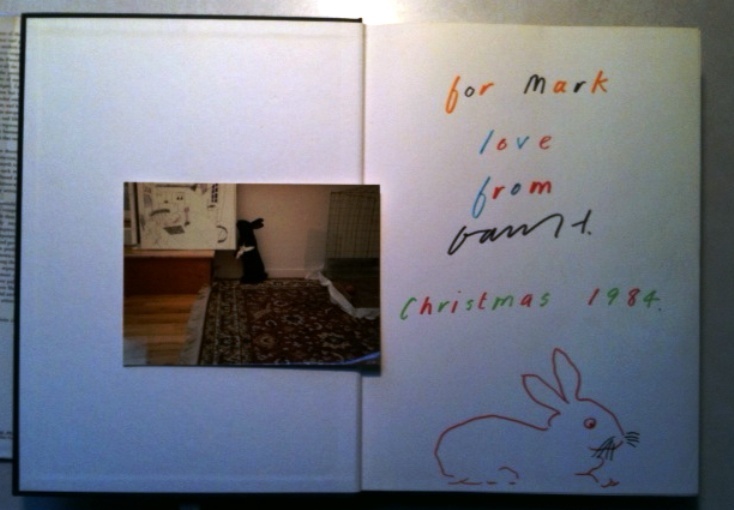 Mark Mahaffey’s pet rabbit, Stones, alongside a Christmas message from David Hockney – just one of the stories that emerged from our discussions with TGL staff members. Thanks paintlater – it’s great to get positive feedback! We’ll keep updating the site as we gather more information.